Showers in the morning, then cloudy in the afternoon. High 57F. Winds ESE at 10 to 15 mph. Chance of rain 40%..
Cloudy skies early, followed by partial clearing. Low 48F. Winds NE at 5 to 10 mph. 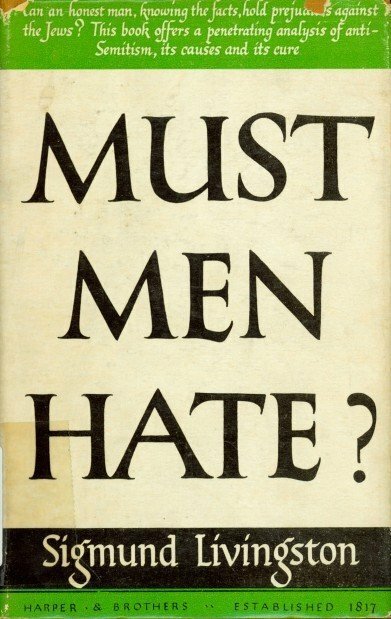 So wrote Sigmund Livingston in his 1944 book “Must Men Hate?” Livingston grew up in Bloomington and practiced law here before moving to Chicago in the late 1920s. While in Bloomington he established the Anti-Defamation League, a national, still-active organization dedicated to combating anti-Semitism in the U.S. and abroad. All things considered, Bloomington’s small but influential Jewish community enjoyed life relatively free of overt discrimination. Even so, local Jews were still the target of prejudice, especially in popular entertainments of the day. Vaudeville, for example, relished the sickening stereotype of the money-grubbing, hook-nosed Jew, and the word “Jew” was commonly employed as an adjective or verb to indicate dishonesty, selfishness and even uncleanliness. Sigmund Livingston graduated from the Illinois Wesleyan University law school in 1894, forming a partnership with classmate William R. Bach, the first of several legal associations in his career. Livingston then moved his law office into the appropriately named Livingston Building when it opened in the early 1900s. Located at the southwest corner of Main and Washington streets, the city’s first (and still-standing) steel-frame “skyscraper” was built by his uncle Ike Livingston, who owned yet another clothing store. By this time Livingston was active in Jewish affairs, playing a national role in the Independent Order of B’nai B’rith, a Jewish social and charitable organization. In 1908, for instance, he headed a standing committee of the group’s Midwest lodge charged with rooting out anti-Semitism. The Anti-Defamation League was established in Bloomington in October 1913 as an arm of the B’nai B’rith, with Livingston as its first director. A grim backdrop to the early years of the ADL was the lynching of Leo Frank, a New York Jew working in Atlanta, Ga., wrongfully convicted for the murder of a 13-year-old co-worker. After the governor commuted Frank’s death sentence to life in prison, vigilantes kidnapped the “Yankee Jew” from jail and lynched him before a gleeful mob. Livingston continued to help shape the ADL for three-plus decades, his active association ending only with his death. The organization remains busy today, keeping an eye on hate groups such as neo-Nazis and the despicable purveyors of Holocaust revisionism. The league has also been an unwavering (and critics would say unnecessarily deferential) supporter of the state of Israel. In 1929, Livingston moved north and spent his remaining 17 years earning a living as a corporate counsel in Chicago. By 1944, the year Livingston’s book appeared in print, there were whispers of vast atrocities in Europe. Yet even the founder of the ADL could not have imagined the unimaginable — the “Final Solution” and its 6 million dead. Sigmund Livingston passed away in June 1946 at the age of 73. He died at his home in the Chicago suburb of Highland Park, and is buried at the Jewish Cemetery on Bloomington’s south side. Have an upcoming event? Share it with us! Have an upcoming event you'd like to see in our calendar? Submit now, it's easy and free.